Robin Hoover has an immigration reform plan that might work. Too bad no one wants to consider it. The Rev. Robin Hoover: "What's being proposed is selfish, and there's a stunning lack of imagination." The Rev. Robin Hoover is pretty pessimistic about the possibility that the Senate will pass the immigration-reform package that was released in mid-May. "That bill's dead," says Hoover, a minister who has dedicated himself to saving the lives of migrants who make the deadly desert crossing. Hoover heads up Humane Borders, an group that fills water stations in the Arizona desert. He's also studied the problems of economic migration for years and believes that having migrant workers in the United States is a net economic plus--a view that appears to be shared by the businesses that keep looking the other way and hiring them. "The states and the U.S. benefit dramatically from migration overall," Hoover says. "But the cities along the border where the migration takes place suffer dramatically" from drains on health-care systems, law enforcement and other social services. But that's nothing new--and should be addressed with help from the federal government. Hoover has his share of problems with the current Senate proposal, co-sponsored by Arizona Sen. Jon Kyl and Massachusetts Sen. Ted Kennedy, with White House backing. "What's being proposed is selfish, and there's a stunning lack of imagination," he says. "They're using arcane immigration-law proposals to deal with a vibrant, dynamic migration phenomenon." He's unhappy with "the largest militarization of the border that we've ever seen." He thinks the fines for illegal immigrants are too punitive. And the biggest problem: The U.S. senators--on both the right and left--who are talking about resolving the problem "don't understand the issue." Hoover acknowledges that the United States needs to secure its borders. "We've gotta have national security," he says. But he complains that the law-enforcement buildup in the Senate proposal--18,000 new Border Patrol agents, 27,500 new detention beds, an initial 371 miles of fencing with more later--is overkill. Instead, the government should implement a viable guest-worker program and give businesses a way of verifying the legal status of workers so foreign workers would come into the country at ports of entry, where they could be subject to background checks and health inspections. If the Border Patrol didn't need to be blocking the flood of job seekers illegally crossing the border, then agents would be able to concentrate on the bad actors. At the heart of Hoover's plan is the idea of creating an economic incentive for foreign workers to leave the country once their visa is expired. Hoover proposes that new guest workers pay a bond before entering the country. Then the federal government would deduct a portion of their paychecks--say, 10 or 20 percent--and add it to their bond account. When the visas expire after a few years, the workers have to show they're leaving the country to claim their money. If they do, they go home with new work skills and nest eggs. 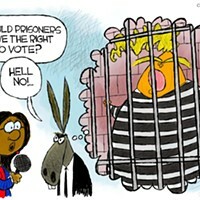 If they don't, they forfeit the bond and become fugitives. There are plenty of details to be worked out, including what kind of fine illegal immigrants now in the country should have to pay to become legal workers, and what sort of hoops they should have to jump through to get on a path to citizenship. But Hoover says the Senate's proposed $5,000 fine sounds too steep to encourage illegal immigrants to report to the government. "There's no real incentive," Hoover says. "If I'm employed, and I've got family and stability and housing, I'm just going to put my head down and hope for the best." Hoover says that many illegal immigrants might just want to go home for a stretch if they could win the legal right to travel, which would help reunify families separated by the border. "A million people would probably get up and go home for a while," Hoover says. "That would be a great creative surge in our business cycle. And then you bring in new people with the new visas." Of course, Hoover's plan will never become law. Critics will say it's too soft on migrants who have already crossed the border and doesn't provide enough of a law-enforcement presence on the border. Instead, the Senate will continue to debate the Kennedy-Kyl compromise. If that doesn't pass, lawmakers will debate the next plan, and the next one. And in the meantime, more illegal immigrants will cross our borders, and more will die slowly in the desert.